Fête-Dieu Conclusion – | TecheToday.com | Teche News | St. Martinville, La. A statue of Our Lady of the Assumption, patron of the Acadians, is carried at the head of a procession from St. Martin de Tours Church to Our Lady of Sorrows Chapel near the end of Monday’s Fête-Dieu du Teche. Fr. Michael Champagne, organizer of the annual event held on Aug. 15, follows carrying the Eucharist. Although Saturday’s flooding rain caused the cancellation of the flotilla down Bayou Teche, Bishop J. Douglas Deshotels opened the day with a Mass in French in Leonville. Recitation of the rosary and Benediction was held in each of the St. Martin Parish communities along Teche throughout the day, concluding in St. Martinville Monday evening. 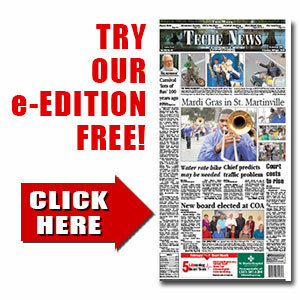 Our website requires visitors to log in to view the best local news from St. Martin Parish. Not yet a subscriber? Subscribe today! Who's gonna win the Super Bowl?